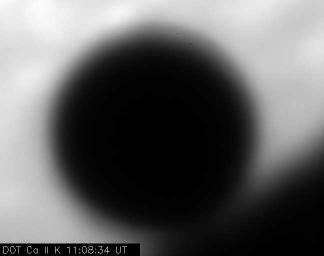 Latest Comment (June 8, 11:30 UT) : Fourth contact has happened - the transit is over! More timings are now coming in from the observers. 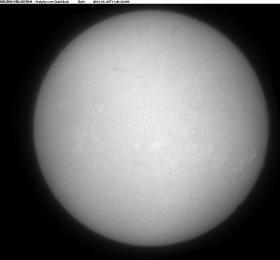 On the picture in the middle from the Swedish Solar Telescope (Tenerife), there is a faint arc stretching upwards from the right edge of Venus' disc. 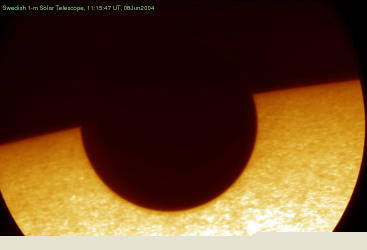 This is very likely a refraction effect in Venus' atmosphere which is being illuminated from behind. Venus, all unconscious of the honour of millions of people watching her, and the hard work put here in the VT-2004 "Control Center", moves onward to last contact. Will we be able, as Lomonosov did in 1761, to see the faint, luminous ring around Venus, i.e. its atmosphere? Three videos from the AGAPE group at ESO are now available - the entry of Venus onto the solar disc, the first part of the passage across the disc and the second part of the passage across the disc. If you missed the beginning of the Venus transit, you may access all previous versions of this Central Display page in the Archive. During the past 24 hours, the VT-2004 website has distributed 1.0 Terabyte; just now, there are about 1200 hits and 400 Mb are sent per second.